The Belkin Lightning Audio + Charge Rockstar cable lets you simultaneously listen to and recharge your iPhone® 7 through its Lightning port. The cable has two Lightning ports — one for power and the other for your Lightning audio headphones. Lightning Audio + Power Adapter: Belkin's Lightning Audio + Charge RockStar makes it possible to listen to Lightning Audio while charging your iPhone 7, iPhone 7+, and many any other iPhone/iPad Lightning devices running iOS 10 or better. Enjoy music or talk through Lightning Audio headphones while you charge. Use the RockStar anywhere - at home, at work, in the car, or on the go. Note: Belkin's Lightning Audio + Charge RockStar delivers power in to your compatible iPod/iPhone/iPad, and only supports Lightning Audio. It does not support syncing or any other USB data, or similar protocol like Serial or UART. Apple MFi Certified: Belkin's Lightning Audio + Charge RockStar has been certified by Apple's MFi program, which confirms it has been designed to connect specifically to iPhone or iPad (with Lightning connector and iOS 10.0 or later), and has been certified by the developer to meet Apple specifications. Note: Even though the iPod nano (7th gen), iPod touch (5th/6th gen), iPhone 5, iPad mini, and the iPad 4 (w/ Retina Display) feature a Lightning connector they are not compatible. Lightning Connectors: The Belkin Lightning Audio + Charge RockStar features one male Lightning connector and two female Lightning connectors. Both female Lightning connectors can be used for audio or charging, but only one will charge and one will play audio at a time. If you try to connect two audio devices, only the first device will work. If you try to connect two charging devices, only the first will charge. Note: You cannot play back audio from both female Lightning connectors at the same time. You cannot charge from both female Lightning connectors at the same time. 12W Pass-Through Charge: 12W pass-through charging powers up your compatible iPhone/iPad with Lightning connector at maximum speed. So whether you're listening to music, watching videos, using navigation, or taking calls, you can charge anywhere. 24-Bit/48kHz Lossless Output: The Lightning Audio + Charge RockStar supports up to 24-bit/48kHz lossless output, and is compatible with the full ecosystem of Lightning Audio headphones (sold separately). The RockStar will also support the higher power delivery required by premium or professional standard Lightning Audio headphones to deliver superior noise cancellation without the need for batteries or an additional power supply. Lightning-to 3.5mm-Adapter Compatible: The Belkin Lightning Audio + Charge RockStar is compatible with Apple's Lightning to 3.5 mm Headphone Jack Adapter (sold separately), so you can use it with practically any pair of headphones, or any home receiver or car stereo with an Aux input (aux cable also required and sold separately). 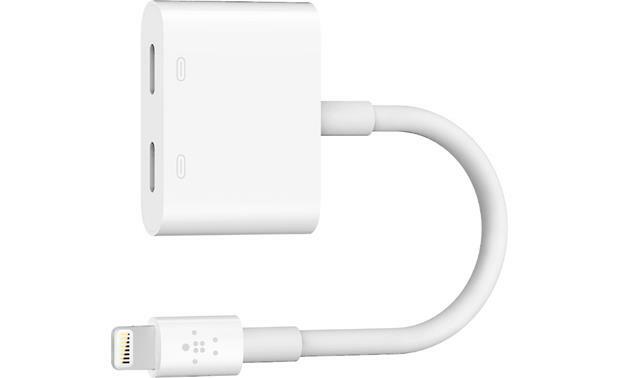 Note: It does not support daisy-chaining of other Apple Lightning adapters - such as Lightning to USB3 Camera Adapter, Lightning Digital AV adapter, and Lightning to VGA Adapter. Searches related to the Belkin Lightning® Audio + Charge RockStar™ Dual Lightning headphone/charging cable.